Interactive programs that teach you to read and count in Russian in an entertaining way. 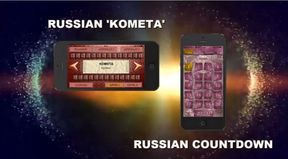 Russian kometa - coming soon! 1. Learning: Learn to read Russian letters! In the middle you can see the word that you hear written in Cyrillic letters. Under the Russian word are its phonetic transliteration and its meaning in English. Each Russian letter reveals a group of words containing this letter. Listen to all the words in the group and learn them! You can navigate the words with arrows! When you press a Letter button, you get access to the group of the words! Press autoplay button to listen to all the words of the group in a row! Press Random button to practise reading the words from all the groups at random! 2. Pronunciation: Test your pronunciation! A Russian word appears in Cyrillic with its phonetic transliteration and its meaning in English. Try to pronounce it and then click the word to hear the correct pronunciation! Repeat practising until you pronunciation is excellent! You can navigate the words with arrows! Make the drill more challenging! Level 1 contains phonetic transliteration of the word and its meaning in English, Level 2 – only the Russian word in Cyrillic! 3. Training: Check out your knowledge! Say the word you see in the middle, find its meaning and listen to the correct pronunciation! If you press Letter button, the words from this group will appear on the display! Press Random button to check out your knowledge of the words from all the groups at random! 03. 12 - count in russian! 1) Training: Learn to count in Russian! 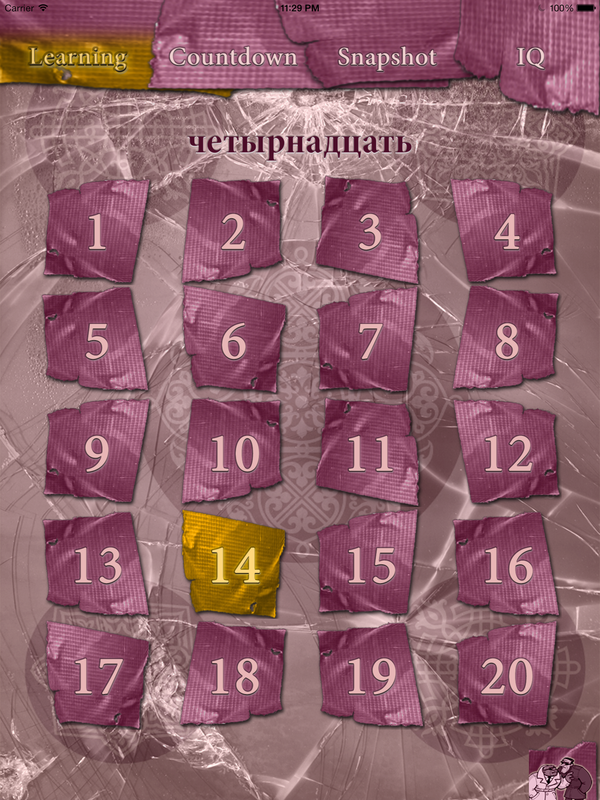 Press the numbers, listen to proper pronunciation and read the numbers in Russian at the top! Practise to the fullest extent – to make a mistake is to lose the game! 2) Countdown: Count down from 20 to 1! Press the numbers that you see and hear! To make a mistake is to lose the game! 3) Snapshot: Snapshot time! The going gets tough! 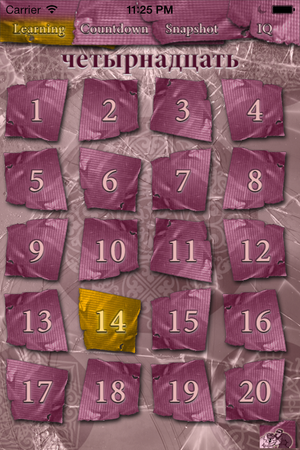 The numbers appear at random! Press the numbers that you see and hear! To make a mistake is to lose the game! 4) IQ: IQ fighters’ time! Look out - the going gets uncontrollable! You see and hear a complicated sum! Solve the sum! If you fail – you are the loser! Do your best to be the Countdown Champion! If you accidentally see this word in Russian ‘KOMETA’ (comet), you will be able to read it because the six letters in Russian and English are very much alike. Read some more words in Russian TOM (Tom), ATOM (atom), TEMA (theme), MAKAKA (macaque). It isn’t difficult at all, is it? There are 33 letters in the Russian alphabet and it will take you about 30 minutes to learn to read in Russian. Make it happen for the developers of the app! If you can’t contribute, that doesn’t mean you can’t help – get the word out about our campaign! We have got more than 5% of the funds that we need for our project! We are very much grateful to all those who contributed! 30 days are left! We do hope that the two educational games Russian KOMETA and Russian Countdown will be downloadable in Apple and Google Play stores by the end of March! Take a moment to check it out on Indiegogo and also share it with your friends. All the tools are there. Get perks, make a contribution, or simply follow updates. If enough of us get behind it, we can make 'Russian 'KOMETA' & Russian Countdown' happen!